Back in February we spotted a rumor that a GTA movie starring Eminem almost happened. It was knocked down the same day by Rockstar's Dan Houser, who said "we never entertained proceeding with the project." Maybe the story pitch was crap, but even if it wasn't, now we know at least one reason why. LA Weekly's Nikkie FInke reports on her blog that a settlement prohibits Rockstar from making a movie based on Grand Theft Auto, which is the same name as a 1977 film whose rights are owned by Fox. The settlement also prohibits Fox from making any video game based on that movie. I've never seen it, but considering all the crappy adaptations done out there, obviously this settlement was more about protecting Fox's copyrights than Rockstar's. 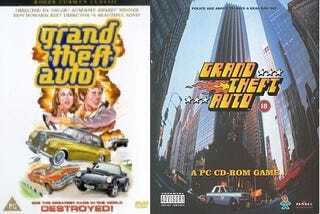 Interestingly, the Grand Theft Auto film in question got an updated box right around the time the original GTA craze hit (above), and you can see the similarities in the typefaces. Not sure if this was part [or provocation] of the settlement or not.